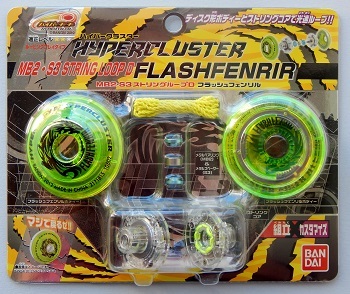 Bandai's "HyperCluster MB2-S3 String Loop D Flash Fenrir" yo-yo, released July 21, 2012. The neon translucent yellow FlashFenrir used a size A ball bearing. The D-shaped body was designed for looping, meaning it had high insides and a narrow string gap. For the response system, the core used String-On-String (aka "SOS") combined with a starburst. The SOS system was originally developed by YoYoFactory for their Loop 720 yo-yo. Basically, it's a yo-yo string that is woven into the core face, next to the bearing. Unfortunately, if the woven string wore out or became cut, it was next to impossible to re-weave the string. In such cases, you would have to rely exclusively on the starburst response and probably use a thicker string. If you wanted to change the looping yo-yo to a string trick yo-yo, you could easily swap out the yellow neon D-shaped body halves and install the blue H-shaped body halves that came exclusively in the HyperCluster DX Customize Set. You could continue to use the same core and bearing. The HyperCluster series took the ease of yo-yo customization to a whole new level. The package showed you other configurations you could build using compatible core parts and bearings from other HyperCluster-series yo-yos. Like all the yo-yos in this line, you could use any of them to earn your Hyper Yo-Yo certification from an authorized Bandai Yo-Yo dealer. Came with the two plastic body halves, core with pads and axle, metal bearing system, string, user guide, customization guide, and trick guide. See the SlashDragon exhibit to see examples of the three guides. Original retail price: $25 US.